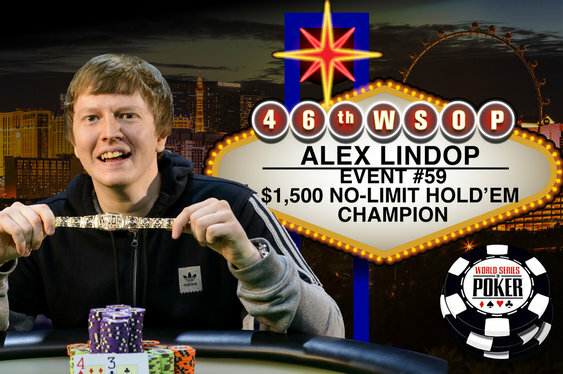 The Brits were out in force inside the Rio, Las Vegas, last night to watch Alex Lindop win his first World Series of Poker title. The young grinder from Stoke not only managed to outlast 2,154 entrants in WSOP Event #54, a $1,500 No Limit Hold'em affair, but beat Jamie Gold in the process. Earlier this week the glare of the media's spotlight was on the 2006 WSOP Main Event champion and his appearance at another final table. However, after Gold's dreams turned to copper and he exited the tournament in fifth place, all eyes quickly turned to Lindop. A confident young pro with a collection of deep runs in UKIPT, GUKPT and EPT events, Lindop managed to carve his way through the final four and secure a 3:1 chip lead heading into the final match with Aurelien Guiglini. Although the run in to the finale was an up-and-down affair, Lindop was eventually able to seize the initiative and eliminate Haixa Zhang in fourth before watching Guiglini take out Yorane Kerignard. That flurry of eliminations left Lindop just one place away from a WSOP title and within 30 hands he was the champion. After a series of bets on a 4h 5d 3h 3d Qh board, Lindop and Guiglini both committed their chips and when the hand were revealed it was the former's 4d 3c that was enough to take the pot, the bracelet and $531,037. Commenting on his win, Lindop stated that he's not quite sure how he's going to spend his newly acquired riches. "I really don't know what I’m going to do with the money. I guess when I get back home, I’ll have to throw a big party," said a jubilant Lindop.